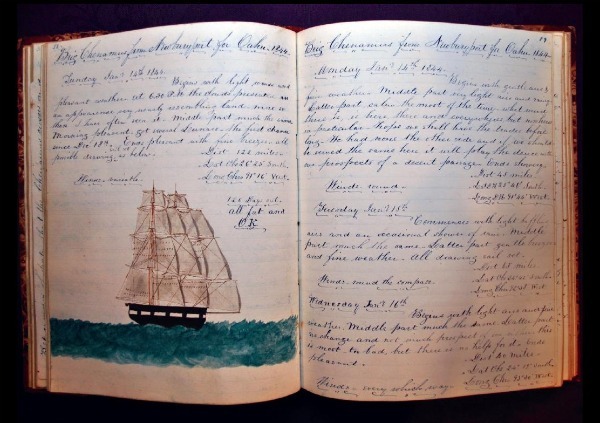 A ships log is actually a legal document, a record of your journey detailing the course you are steering, weather conditions etc. If there is any kind of incident, the information you have in the log can be used as evidence, so it is important to keep in up to date. I prefer to have a big hard covered notebook to write my log notes in as opposed to being restricted to filling in little boxes in a pre-printed log. I like to write a few notes about what is going on and my handwriting is rather large, so I think it would look better to be free format. It is also the format I use in my current log on Wildwood. I will have my passage plan on one page, and then the log notes following that. When I did my Coastal Skipper Course, the person marking my passage planning assignment suggested that you should write in the log every 30 minutes or so. However on our last coastal trip, we started out writing quite regularly, and then reduced it to around the time of each watch change. I guess it just depends on what is going on, but either way, the log should be completed on a regular basis. A small printed map of the whole area to paste in to the log book might be useful when referring back to the journey. In my current log book I have also pasted a map of the marina that we were heading to, the tide tables and current chart for navigating through Tory Channel. A log is a record of all the adventures we have along the way, the people we meet, places we anchored, daily weather conditions etc. You can use the information when you travel back to that place, or recommend it to others. You can buy some lovely Ships Log Books on Amazon.